recently i was playing a bit with setting up the dijkstra algorithm in arma. With the following code you will be able to navigate from your position to a marker on the map. I have a problem on Tanoa. The first part with the 1000 _iterationCounter loads like 20seconds. It runs over and over again but dont finish, because _workQueue gets never under 0. I tried it with differtent way lengths. No chance. Still loops in workQueue. they code related to this post is pretty outdated right now. I would offer you to connect via steam, so i can give you a better version of the code and support you with questions. My steam account name is "Spiderswine" as well, feel free to send me a request. @Spiderswine if nothing speaks against it, I am sure others would appreciate if you could either update the code in the first post or add a link to the recent code. Feel free to write me if anything does not work so i can take a look. I updated @Spiderswine files with private variables and some other performant options etc. in addition I put it all into one file you only need to run with some params. Here it is, you need to give start pos/object & destination pos/object as params. It returns automaticly the destination path as array of road objects, so you can use it for everything you need. Use this code to get the nearest road because Arma3 does handle it like in that picture for the first road. 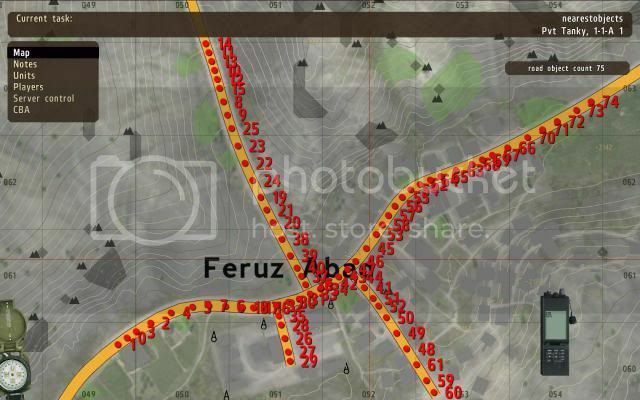 On the picture the nearRoads command was used for the middle position of Feruz Abad with a 50meters circle.